Ketamine was U.S. FDA approved as an anesthetic in 1970. It is still used today as a general anesthetic in ten times the doses used for Depression. It will likely never gain U.S. FDA approval for Depression as the original patent on it has expired. Currently, Pharmaceutical companies are studying modified versions of Ketamine. All studies published on Ketamine for depression were performed by MD Psychiatrists. 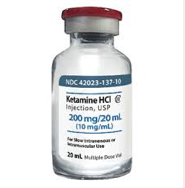 Ketamine is administered in "sub-anesthetic" doses resulting in the patient being fully awake during the time of treatment. 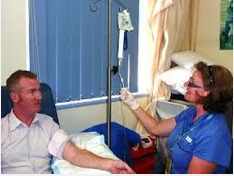 The time of IV infusion is approximately 45 minutes, with a 30 minute observation period afterwards. Ketamine should only be administered under the supervision of an Anesthesiologist experienced in it's use. The most common side effects are mild sedation, dizziness, wooziness, and mild alterations in heart rate and blood pressure. 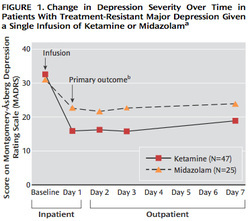 Ketamine has a very rapid effect compared to other Depression treatments. The time to feeling better ranges from during the IV infusion itself to within 24 hours afterwards. The benefits can last up to weeks after a single dose. It is still trying to be figured out how to use Ketamine in the long-term to maintain wellness, therefore monitoring of the overall course of treatment should be done by an MD Psychiatrist experienced in the area of Treatment Resistant Depression. Many patients seem to remain well on infusions every 4 to 6 weeks. The latest information suggests that it will be prescribed based on a Symptom Driven Schedule (SDS); the same approach that I have used for over a decade with my longterm Maintenance ECT patients.